Radio and podcast streaming service Mixcloud has rebuilt and re-released its Android app with a new user interface that focuses on providing tailored radio recommendations. Its updated user interface leads to a personalized feed that lets listeners build a radio station out of their favorite shows and DJ sets, and a "Discover" tab that Mixcloud describes as a "Netflix-like" page that points out radio shows users are likely to enjoy. Mixcloud's major competitor in the music upload market is SoundCloud, but unlike that service, Mixcloud's users aren't allowed to upload individual songs to the service. Users instead create "shows" from eight or more tracks, and upload them with a supplied tracklist to ensure the creators of copyrighted songs receive royalties. Mixcloud has also attempted to differentiate itself from SoundCloud by appealing specifically to producers and consumers of electronic music. Its playlists are stocked with cuts from 500,000 "partners" that include top-line electronic artists, taste-making blogs, and aspiring bedroom DJs. Anyone can upload shows to the service. They are then sorted democratically: shows and sets that get played the most get foremost placement on popularity charts, regardless of their creator. The result feels both chaotic — it's hard to tell the quality of a show or set from its dense title — and vibrant, as established live acts release whole sets alongside promising young newbies. The recommendation system is solid, too, offering granular categories particularly suited to dance music. Connoisseurs of dubstep, deep house, and EDM will find themselves well served by easy-to-create feeds that use a tag system to inform of new shows relevant to their interests. 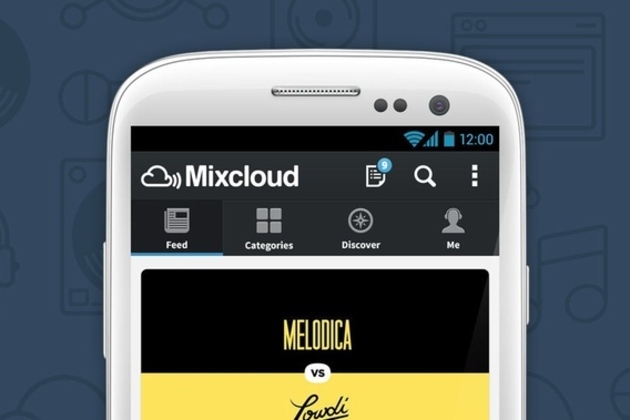 Along with the all-new Android app comes an update to Mixcloud's iOS version. Both updates are available now on the Google Play store and Apple's App Store. Mixcloud offers unlimited storage for free, so budding radio stars won't need to worry about paying up for a subscription plan.